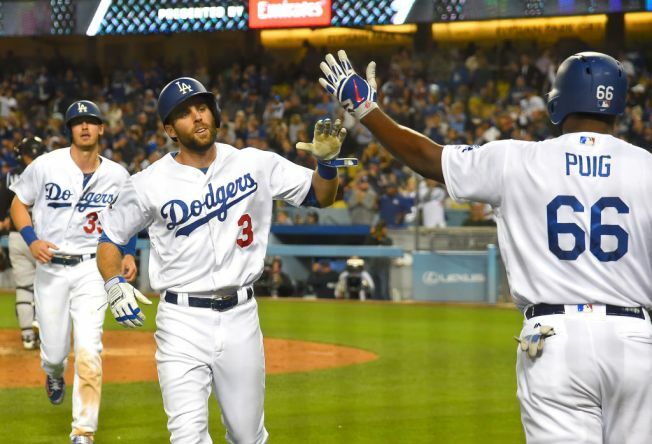 Chris Taylor and Yasiel Puig hit back-to-back home runs and the Los Angeles Dodgers came from behind to beat the rival Colorado Rockies, 5-3, on Tuesday night at Dodger Stadium. Back to back like I'm on the cover of Lethal Weapon. After a frustrating night at the plate on Monday saw the Dodgers drop their fifth consecutive game at home, the Boys in Blue looked to rebound with Brock Stewart on the mound. Stewart, who was activated earlier in the day from Triple-A Oklahoma City, was making his first start of the 2018 season, and just the tenth of his big league career. "It's exhausting being everywhere," joked Stewart of all the shuffling back and forth he's done this season. "It's tough for sure. It's not ideal, but someone has to be the guy that is here every time the team needs help. I'm happy to pitch for the Los Angeles Dodgers. Every opportunity I get I'm going to make the most of it." Matt Kemp got the scoring started in the first inning for Los Angeles following a ground-rule double off the bat of Justin Turner. Two batters later, Kemp singled off Colorado starter Chad Bettis to give the Dodgers the 1-0 lead. Kemp as been on a tear lately, hitting .471 with runners in scoring position this season, the second best mark in the Majors behind only Manny Machado (.472) of the Baltimore Orioles. "They [the Dodgers] concentrate on hitting with runners in scoring position," said Kemp. "I try and lock in and get those big hits. It's easier said than done, but we want to get those hits with runners in scoring position." Bettis then surrendered a double to Cody Bellinger before walking the next two batters to bring in a run, and gift L.A. a two-run lead. Bettis would settle down, and not allow a hit over the next four innings, but did not factor in the decision, allowing two runs on three hits with three walks and four strikeouts in five innings. "We got him stressed early," said Dodgers' manager Dave Roberts. "We let him up for air for a while there, but got him out of the game and got some insurance runs." The Rockies would rally to tie the game after Ian Desmond sent Stewart deep for a solo shot in the second inning and Nolan Arenado scratched a run across with an RBI single in the third. #Jonronazo solitario de Ian Desmond nos pone en la pizarra. Stewart also did not factor in the decision, allowing five hits on two runs with one walk and one strikeout in four short innings. "Not good. Not bad," said Stewart of his first start of the season. "I got behind pretty much everybody and had to battle. It was a very meh outing stuff was." In a déjà vu moment from the night prior, the Rockies took the lead thanks to a walk and some mental errors by the Dodgers against the bullpen. Reliever J.T. Chargois issued a leadoff walk to Trevor Story who then promptly stole second, and took third on a passed ball. Two batters later, Story would score the go-ahead run for the Rockies on an RBI single by Desmond. One night earlier, relief pitcher Pedro Baez would walk Tony Wolters, who then stole second and advanced to third on an errant throw by Yasmani Grandal. Two batters later, Wolters would score an infield single and error by second baseman Chase Utley. However, unlike the night before, the Dodgers recaptured the lead thanks to the bats of Chris Taylor and Yasiel Puig. Taylor started the rally with a two-run home run on a hanging slider by Bryan Shaw that gave the Dodgers the 4-3 lead. "It felt good just to contribute and help the team win the game," said Taylor. "I've been struggling a little bit and to be able to come through in a big situation and come through for my guys felt good." Two pitches later, Puig also sent a slider from Shaw deep into the seats in left field for the extra insurance run, and third time the Dodgers have gone back-to-back this season. "I was looking for something very fast like 95MPH," said Puig of the at-bat. "He threw me a cutter first pitch that I had never seen. He threw me a slider and finally I swing and do contact with the ball and came a home run." All five of Puig's home runs have come in the last eight games in which the Cuban slugger is batting .318 with six runs, one double and seven RBI. Kenley Jansen closed the door for his ninth save of the season, snapping the Dodgers five-game losing streak at Chavez Ravine. The finale of the three-game series is on Wednesday as LHP Kyle Freeland takes the mound for Colorado opposite RHP Kenta Maeda for the Dodgers. First pitch is scheduled for 7:10PM PST. If you can't view the embedded videos, click "VIEW THE FULL MOBILE SITE" at the bottom of this page.